Group 1: For the third consecutive Western Conference race, Rylan Hazelton opened the slate with a Super Touring Under win in his No. 49 Driving Ambition/BFGoodrich Tires/HPD/Comptech Honda S2000. This time, however, it took some work. Hazelton again got in front, but had Tom Wickersham’s No. 74 Maine Straight Racing/BFGoodrich Tires Honda S2000 chasing hard for the race’s duration. With the car getting more and more free as the race went on, Hazelton had at least one major moment when the back end tried to come around quickly, but gathered up and made the finish. Derrick Ambrose led the B-Spec race early on in his No. 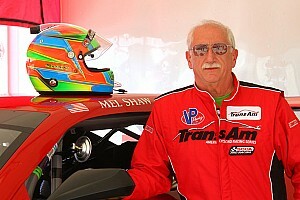 71 Corksport Mazda Performance/Monarch Inspections/BFG MAZDA2, but Michael Tsay closed the gap on lap eight in his No. 45 Honda Racing/HPD Honda Fit. On that lap, Tsay tried to use an opening created by overall leader Hazelton on the inside of Ambrose through the Riverside turn, but the pair made contact. Ambrose spun across the front of Tsay’s Honda, and his day ended while Tsay continued the distance for the win. Troy Ermish took the GT-Lite win in a brand-new, old car. The No. 38 Datsun 510 Parts Outlet/LS Energy Corp Datsun 510 was built nine years ago, but circumstances left it in a garage, unraced. Ermish bought the car, worked on it over the winter, and brought it to the track for the first time at Thunderhill with an eye on the 2014 SCCA National Championship Runoffs at Mazda Raceway Laguna Seca, his home track. Teething issues plagued him throughout the weekend, but the car was flawless on the way to a win on Saturday at Buttonwillow. Group 2: A first corner incident ended the day of three drivers and left the field to circulate under caution in the second race of the day, but once green, two drivers needed the full 30 minutes to earn wins. David Ferguson brought his brand-new Prototype 2 No. 75 Veracity Racing Data/Mazda/Hoosier Van Diemen RFS-03/Mazda to Buttonwillow, and it let him down in the first qualifying session as he worked out the kinks. Ferguson started next to last, and then picked his way through the early incident. With three to go he had written off any chance at a victory, still eight seconds behind Paul Decker. Traffic fell in his favor, however, and Ferguson began to reel Decker’s No. 89 Decker Sports Racing/Hoosier/Decker’s Hot Camp Showers/Global Wine Cellars Decker Mk 1 in. Knowing the track, Ferguson decided on the back stretch of the last lap that he was going to make his move in the left handed corner known as “Phil Hill” – and then pulled it off for the first Mazda P2 win in the Western Conference. 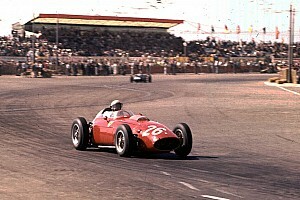 The Formula Continental race was also decided on the final circuit. Yufeng Luo led in the No. 61 Van Diemen BP08 for most of the race, but the tandem of Tom Hope and Andrew Evans had closed to his gearbox when the trio took the one to go board. Luo dropped two wheels off and Hope got a great run down the long back stretch to move into the lead, bringing Evans’ No. 127 Van Diemen RF02 along with him. With a big fist pump at the checkered flag, Hope’s No. 18 H & M Racing Dart Carbir ZTec crossed just in front of Evans and Luo for the win. Group 3: While the time sheets show some comfortable wins, some of the third group’s winners had hairy moments on track. Aaron Bailey won American Sedan in the No. 21 BFGoodrich Tires/RentMyRV.biz/BRE Chevrolet Camaro, but listened to an unidentified noise from his transmission throughout the race. Mike Henderson was trying a new set-up with a new tire size, but still on GT-3 in the No. 2 Mazda/Redline Oil/Goodyear Mazda RX-7. Chuck Matthews snuck his No. 38 RecreationConnect.com/Esprit Cam Systems Chevrolet Corvette around Spencer Trenery’s No. 15 Fantasy Junction Porsche GT3 just prior to the halfway point, and then survived accidental contact with a car in a different class to bring home the win in GT-2. Group 4: The two top Spec Racer Ford drivers on the West Coast, based on recent results, are Mike Miserendino and Todd Harris, and the duo separated themselves from the rest of the field on Saturday to sort out the race. Harris moved his No. 24 Pro Drive Racing/HMS Spec Racer Ford to the inside and outside of the No. 11 MBI Racing machine, but no one knows his way around Buttonwillow better than Miserendino, who serves as the track’s business manager. Miserendino held off the charge and took the win, with the pair well in front of TJ Acker’s No. 62 MBI Racing/Cindescency Spec Racer in third. Group 5: The Spec Miata race was pared down to three drivers, who then sorted out the podium on the final two laps of the race – including in the last corner. Mark Drennan put his No. 10 No Wife No Kids/TFB/Riverbed Miata in the front early, opening up a gap while Charlie Hayes’ No. 22 TFB/AIM Tires/RM Autosport Miata and Elliott Skeer’s No. 77 Rush Motorsports Miata worked together behind him. That gap closed as the minutes counted down. Hayes had gotten in front briefly on the penultimate lap, but Drennan led across the stripe as they saw the one to go sign. Drennan admittedly made a mistake as the trio worked through the opening turns and dropped a wheel into the dirt, allowing Skeer to push Hayes in front down the back straight. Skeer and Hayes came into the corner side by side, with Skeer on the inside. That gave Skeer the run he needed to the checkered flag, stealing a win after running third for most of the race. Hayes finished second, Drennan third. Group 6: William Brinkop took the overall win in the group, piloting his Touring 1 No. 78 TC Design/Synergy Motorsports/Abel Chevrolet/Hoosier Chevrolet Corvette to the front of the field, ahead of Ken Davis (No. 64 Davis Stone Inc. Chevrolet Corvette) and Oli Thordarson (No. 22 Alvaka Networks/949 Racing/RPM Motors Corvette) in a Corvette podium sweep, while Tom Wickersham (No. 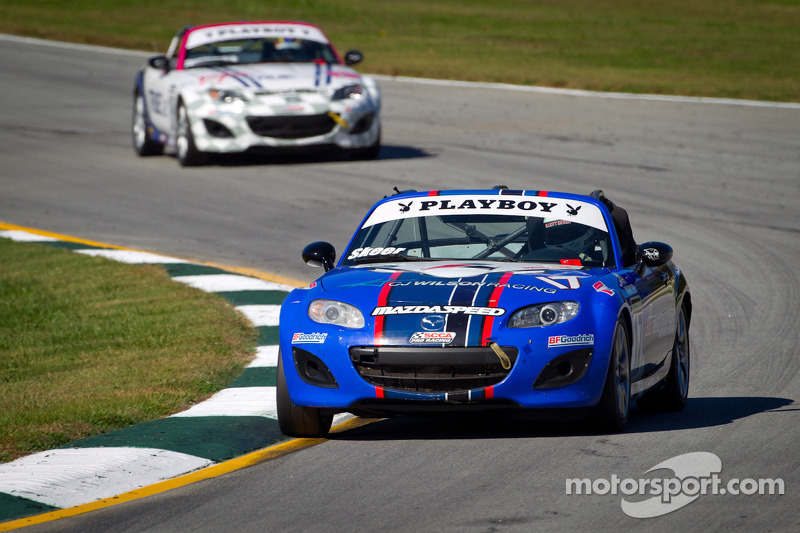 4 BFGoodrich Tires/Maine Straight Racing BMW Z4) and Kyle Kelley (No. 79 UPR.com/Apex Chevrolet Corvette) won Touring 3 and Touring 2, respectively. Aaron Downey and Brian Linn were the E Production and F Production winners, respectively, but it didn’t come without incident. Downey’s No. 5 RoundPeg.com/Mazdaspeed Motorsports/Carbotech Mazda RX-3 and Linn’s No. 4 Hoosier/Red Line/Carbotech/Steve Hussey Lotus Super Seven made side by side contact during the race, but both continued to their respective victories. Group 7: The Formula Vee race stole the show in Group Seven, with the veteran Brian McCarthy and relative newcomer Terran Swanson swapping the lead several times throughout the race. Swanson led early in the No. 76 Toad Hall Enterprises/Swan Tech Graphics Mysterian M4, but McCarthy used him as a carrot to catch back up to the lead. Each driver was stronger on different parts of the track, with McCarthy getting quicker as he followed Swanson. With time winding down, the pair crossed the stripe just in front of the No. 2 Van Diemen RF02 of Nikita Lastochkin, the overall and Formula F leader. Lastochkin got the one to go signal, and would move around the Formula Vee leaders before they could see the board. 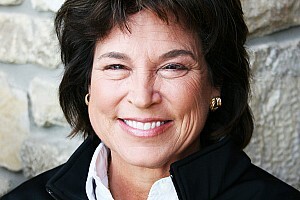 That set-up a bit of an advantage – Swanson had radio contact with crew members, and McCarthy did not. McCarthy gave Swanson room as they completed the last corners of the race, still driving hard but not defensively. Swanson got a run through the last corner and pulled in front by a car length as the checkered flag flew. After the race, still smiling, McCarthy said that the 21-year-old had delivered a new energy to the Western Conference Formula Vee field, forcing him to step up his game to keep pace. Round Eight of the SCCA Western Conference Majors Tour will run on Sunday morning from Buttonwillow, beginning at 9:05 a.m. (PST) with 16 lap or 45 minute races, whichever comes first. Results, links to live timing and scoring, and more information is available at SCCA.com/ButtonwillowMajors. Provisional race winners for Saturday’s Western Conference Majors Tour Round Seven at Buttonwillow Raceway Park. Drivers are listed by Class: name, hometown, and car.